In the Topalov-Aronian game at Linares Topalov missed a beautiful, hard-to-see but not hard-to-calculate, combination. His previous good luck combined with Aronian’s previous bad lack inspired a remarkable summary from one commentator. Strange as it might sound, the result of the encounter was fair. In the bigger picture. How lucky had Topalov been? 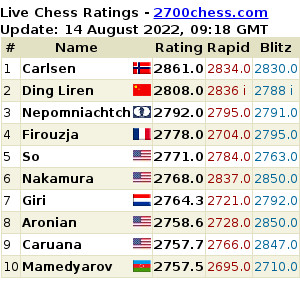 How many points had Aronian missed out on? So things balanced out. If you just take this game then Levon’s play, to be polite, didn’t impress. 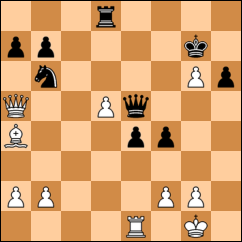 His problems began with the listless 23…Re8 (23…Bb4 almost equalised), which was followed by the strong 24. h4! Black’s position got worse with each move, right up until the culminating moment. However, instead of ending the game in one fell swoop (34. Rxe4!! ), we suddenly saw the wheel of fortune rolling in the opposite direction, away from the recent child of fortune. I won’t try to judge what happened up there in the heavens, it’s not for us. In the same report Vasiliev appears to be the first to break the news about Rxe4 to Aronian (he hadn’t seen it). Aronian was generally upset that when he needed to win he’d let Topalov get in the attack with h5.